I was called on not too long ago to review a database and explain why segue rules were not working using the automatic scheduler. When I opened up this databases rule tree, all the coding rules were repeated over and over and over again in each category. The same rules, but multiplied and inserted within the folders of each category. That’s a lot of work with no actual reward! A good rule of thumb to consider when building rules for the automatic scheduler: Inside the category, the rule applies to that category, not the others. So, if a category is in each quarter hour and it is not next to itself, the “segue” tests in the rules within the category will not work like you might expect when using the auto scheduler. The rules you should be inserting in each category should be: Minimum Rest, rotation rules (i.e., Day Offset Windows, etc), Max plays per day, shift rules, specific artist separation rules and any Optimum Goal Scheduling rules you decide on. Why? 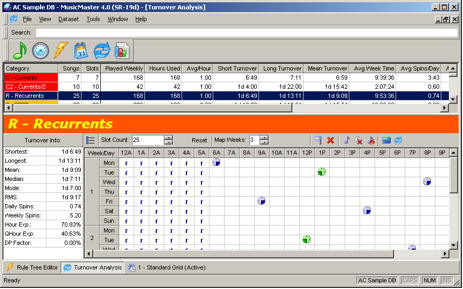 Each category rotates differently and normally requires some kind of different setting in the areas listed above. What are you to do with the coding rules? This is where the “All Categories” section of the rule tree comes in, and where you can build coding rules for specific categories using “Rule Groups”. What is a Rule Group? 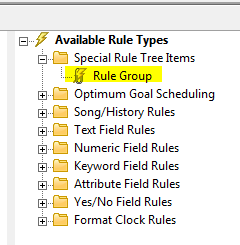 On the right hand side of the Rule Tree …the very first folder at the top contains Rule Groups. Drag a Rule Group over to the All Categories section. When it opens set up your parameters in the Rule Properties. Description: Give it a name so you know what coding rules should be applied. 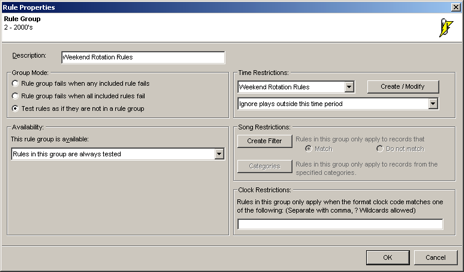 Time Restrictions: You can daypart rules in the rule groups so if you have a Saturday Night Jam, you can apply a completely different set of rules to those hours. In addition to the time restriction you decide when and where the rules are valid. Test against plays in ANY time period/Ignore FAILURES outside this time period or Ignore PLAYS outside this time period. Group Mode: You decide on how to handle failures. I personally always select “Test rules as if they are not in a group” so I can see specifically which rule failed when reviewing the “Recap Report”. 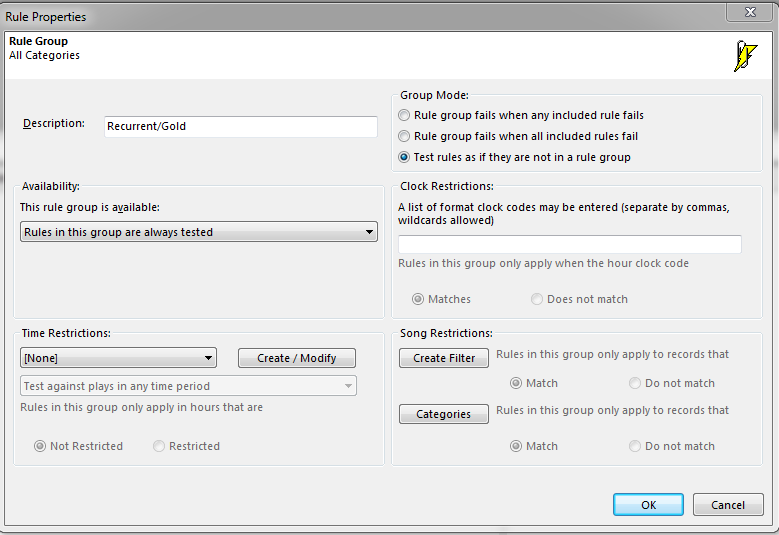 Clock Restrictions: Rather than using dayparting rules you can apply rules inside a rule group to specific clocks. 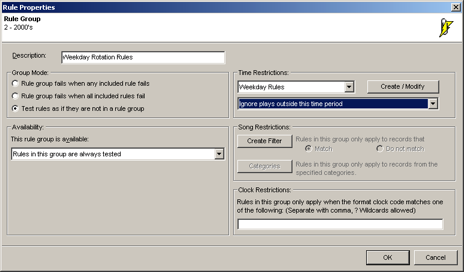 Song Restrictions: This is where you can select which categories your rules inside the rule group would apply to. You can also create Filters. 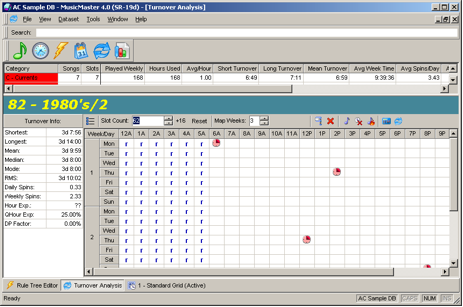 For instance you can select a Specific attribute code(s) or Keyword(s) and apply specific rules to those items. One last thing: Making sure the rules you want are actually IN the Rule Group! I see the scenario from the image below a lot, during support calls. Of course, you can use Rule Groups inside an individual category as well. Say you are plotting more Light Currents in the overnights than you are plotting during the day. You can use two Dayparted Rule Groups within the category, each with its own distinct Minimum Rest and rotation settings. You may need a one hour rest during overnights and a three-hour rest setting during the day. That will just depend on your clocks and turnovers. Here is to happy, healthy Rule Tree’s in the land of MusicMaster! If you have any questions or concerns, contact your Music Scheduling Consultant! This is quite simple to set up, so if you follow this step by step you’ll be done in no time! 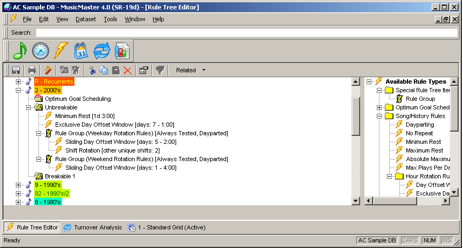 Open your Rule Tree and go to the very first folder in Available Rule Types on the right hand side of the rule tree, called “Special Rule Tree Items”. Inside that folder you’ll see Rule Groups. First drag two rule groups into either the Breakable or Unbreakable folder of the first category you’d like to work on. Identify one Rule Group as your weekday rule group and the second as your weekend rule group. Once you’ve created a Time restriction for each rule group…be sure to select from the drag down menu immediately below your Time Restriction window “Ignore plays outside this time period”. Once you have these first two Rule Groups set up, don’t populate them yet! Copy and paste the empty rule groups into the other categories you’d like the “Ignore weekday or weekend rotation rules” to adhere to. Once you’ve done that, populate your rule groups with rotation rules that make sense for each category. In the close-up below you’ll see a Minimum Rest rule and Exclusive Day Offset rule that are “outside” the rule group and will be adhered to 24/7. Inside the rule groups you’ll see some “dayparted” or “time restricted” Rotation Rules. Also, in the example below, the Sliding Day Offset rules are different since we’re dealing with a larger window for the weekday rule group and a small window for the weekend rule group. 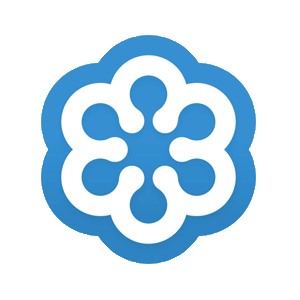 For more information about how to set up Rule Groups and the correct rules for your library, contact your Music Scheduling Consultant!